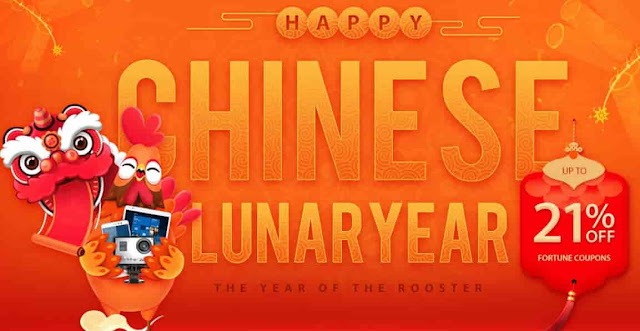 Are you thinking of making use of the Chinese Lunar Year holiday to buy Smartphones, Gadget and accessories? Don’t worry, Gearbest got you here! You can do so affordably with the 21% fortune coupons just for you! Take advantage of the DoublePoint, 13% OFF Coupon when you buy and order any items during the lunar season from Gearbest store. Take note that this promo is not available for both the US warehouse and EU warehouse. The Chinese New Year, commonly known as the Spring Festival, is the most important holiday on the Chinese calendar. Families come together for feasts and other celebrations to honor deities and ancestors. The New Year celebrations start on the first day of the first month in the traditional Chinese calendar and ends 15 days later with the Lantern Festival. There really isn’t anything better than starting the Lunar New Year right with a well-deserved Discounts for you and your loved ones. The promo start today, you should take advantage now before it ends. You can visit the promo page here to get started on any items you want.